Типичный извержения стиль: Explosive. During the last centuries, mainly small explosive eruptions of short duration. Gede volcano near Bogor is one of the most prominent volcanoes in western Java. 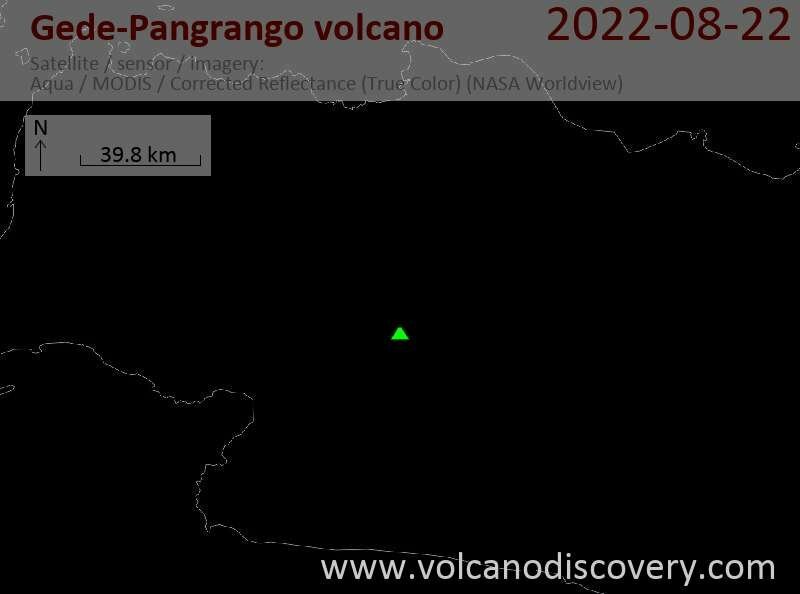 Together with older Pangrango volcano to the NW it forms a twin volcano, with Pangrango volcano having the highest point at 3019 m.
Gede volcano is also known as Gedeh, Ageung or Agung. The Gede-Pangrango complex dominates the cities of Cianjur, Sukabumi, and Bogor lying below to the east, south, and NW, respectively. The 15,196 ha Mt Gede Pangrango National Park is a popular weekend destination for the city population nearby and famous for its many scenic rivers, waterfalls, lakes, warm springs, as well a unique mountain fauna and flora ranging from rainforest, elfin woodland to subalpine grassland. Geologically, Pangrango volcano was built over the NE rim of an older 3 x 5 km caldera, and is now considered extinct. Younger Gede volcano has erupted many andesitic lava flows on its flanks including historical ones. Active vents at the summit of Gede have migrated about 1 km to the NNW over time, leaving 7 summit craters: Baru, Gumuruh (2,927 m), Lanang (2,800 m), Kawah Leutik, Ratu (2,800 m), Sela (2,709 m) and Wadon (2,600 m). Kawah Lanang and Kawah Wadon are the most active craters at present and have hydrothermal activity. Historic activity: Gede has had at least 21 eruptions between 1747 and 1957, most of them small to moderate in size (VEI 2-3). The eruption in 1840 was the largest and generated pyroclastic flows. The 1947-1948 and 1955 eruptions were phreatic. The eruptions in 1840 and 1852 caused damage but no fatalities. Gede's most recent eruption on 13 April 1957 ejected ash to 3 km above the crater and formed two small cones on the north flank, 11 km from the summit. It has been noted that the city of Cianjur lies on the deposits of a giant debris avalanche deposit originating from Gede, showing that the volcano underwent phases of massive flank failure. Historical activity has been recorded since the 16th century and consited mainly of small and short-lived explosions. Iguchi et al. (*) conducted seismic measurements at several of West Java's volcanoes including Gede volcano in August 1997. They found that volcanic earthquakes, A-type earthquakes with clear P and S-waves, were concentrated in a vertical zone beneath the summit crater at depths ranging between 2-8 km. Seismicity increased slowly since February 1991 and peaked in an earthquake swarm at Gede volcano between 29 April and 1 May 1991, but was not followed by an eruption. On its peak on 29-30 April, about 100 volcanic earthquakes (40 deep and 60 shallow) were recorded per day, an increase of a factor of 10 compared to normal levels. On 30th April 3 shocks were felt. Seismic activity returned to normal levels in May.